Crunchgear needed a bag that holds all their junk and was padded enough so that said junk wouldn't break. 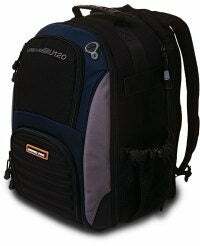 The solution came as in the form of a Naneu Pro u120, which they named the "finest bag in its class". The main compartment acts like a regular backpack, or can be used to fit the removable camera-case to hold your camera and a multitude of lenses. There's a laptop compartment to hold one up to 15-inches. If you've got a 17-inch porker, you can always go up to the Naneu Pro u220. Other than notebooks and cameras, the bag also holds pens, notepads, headphones, and various other survival utilities. The reviewer also took the bag around the streets of New Orleans while putting it through its paces. If it can stand up to New Orleans, it should do fine for your daily commute.